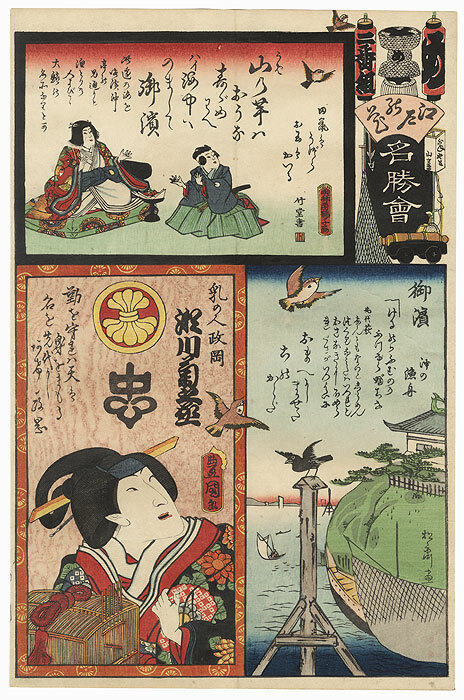 Flowers of Edo and Views of Famous Places - Terrific design from an 1862 - 1865 series by Toyokuni III pairing kabuki actors with famous areas of Edo, done in collaboration with several different artists. 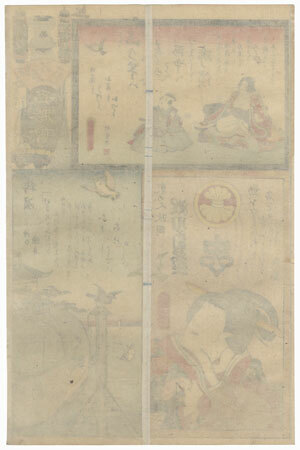 Toyokuni III created the large actor portraits, while other artists such as Hiroshige II, Sadahide, Kunihisa, and Kyosai contributed the landscape designs and other scenes across the top. The term "Flowers of Edo" in the title here refers to fires, and each title cartouche features the standard or matoi and lantern of a different Edo fire brigade. The expressive portraits are beautifully detailed with fine line work and an intricate wood grain background. A beautifully printed series, with many images featuring fine shading, embossing, or touches of burnishing. 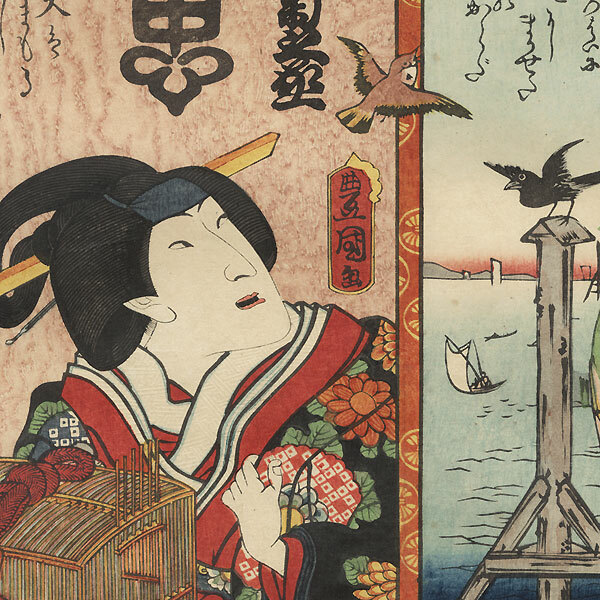 The Boston Museum of Fine Arts has many prints from this series in its collection. A great choice for a kabuki enthusiast. Condition - This print with excellent color and detail as shown. Backed with paper. Vertical centerfold. Slight toning and soiling. Some prints have a few small spots or slight rubbing at edges. A few prints have slight separation at ends of fold or a couple small wormholes, repaired. Please see photos for details. Generally in good condition overall.